The barrel will be auctioned off at the Oregon Wine Experience Medal Dinner and Barrel Auction on August 19 at Bigham Knoll. 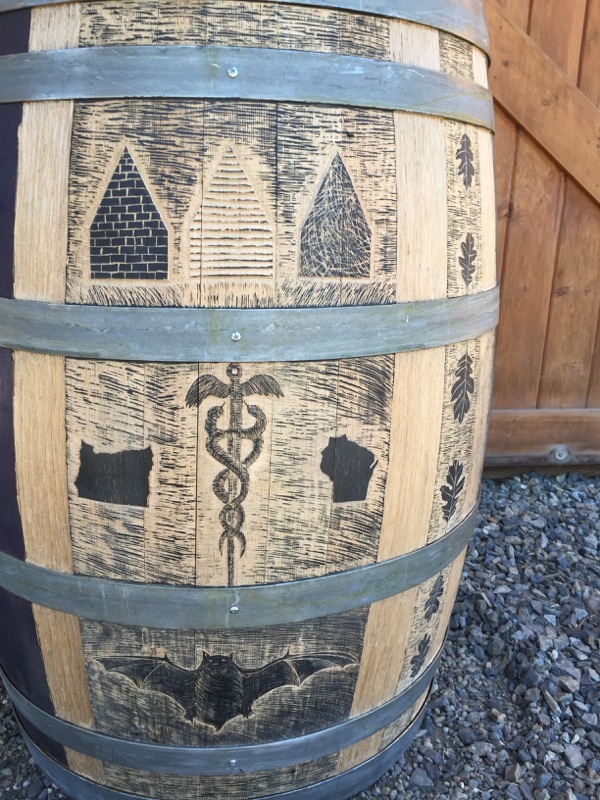 Robert’s artistic wine barrel embodies the story and history of the Ledger David Brand and will be on display at Harry & David in the weeks leading up to Oregon Wine Experience. You know he can cook. You know he can talk wine. But did you know that he is also a multi-talented artist? 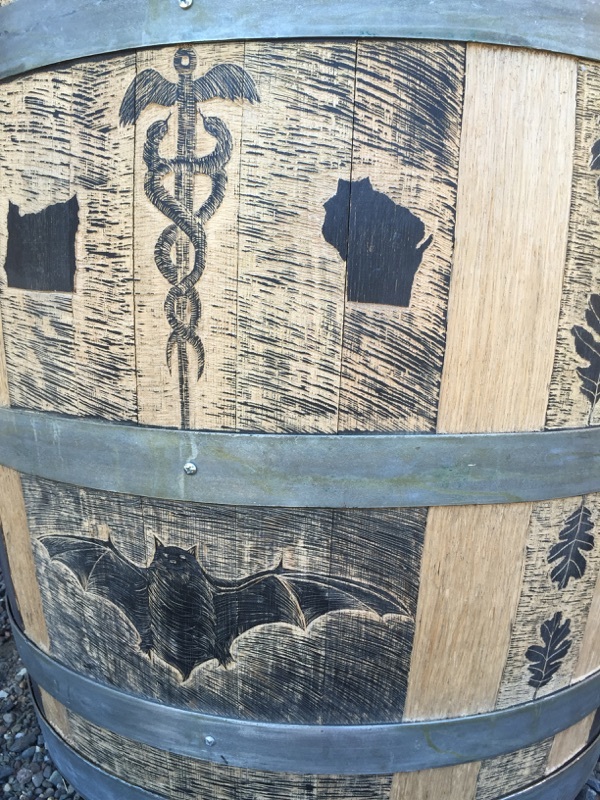 It is for this reason that event organizers selected Robert Trottmann as one of just a handful of local artists commissioned to design a wine barrel for this year’s Oregon Wine Experience. Robert’s barrel is a true inspiration that embodies the story and history of the Ledger David brand. Robert, who holds a Masters in Fine Arts (M.F.A. ), uses unique painting and carving techniques in this utilitarian piece that represents ‘the pictorial narrative tradition’. 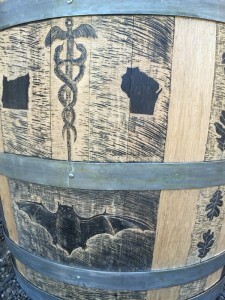 The barrel will be on display at Harry & David Country Village in Medford in the weeks leading up to the event. The one-of-a-kind barrel will then be auctioned off at a special Medal Celebration and Barrel Auction, Wednesday, August 19 at 6pm. You can also join Robert and the Ledger David team at Oregon Wine University for Wine 101: How to Choose, Pair and Serve Wine. This interactive class, which takes place Thursday, August 20 at 1pm at Bigham Knoll in Jacksonville, takes attendees on a journey through a brief overview of wine sensory and evaluation, what’s behind the tasting notes, and simple methods to help you pair your go-to wine with your favorite foods. Course is $49 and includes logo wine glass, wine flight and sample food pairings. For more information or to register, visit www.theoregonwineexperience.com. The Oregon Wine Experience is Oregon’s newest destination event. The entire week-long event will be held August 17 to 23 at Bigham Knoll in Jacksonville. Sponsored by the Asante Foundation and Southern Oregon wineries, this will be a spectacular week of extraordinary wines and fabulous meals served in a backdrop of some of the Northwest’s most dramatic and beautiful wine country. The Oregon Wine Experience will showcase what many critics have called the next great wine region. It will feature wine talks, tastings and sensory classes, intimate vintner dinners, wine competition, and auctions crowned by an outdoor salmon bake with music and dancing under starlit skies. Proceeds from the Oregon Wine Experience benefits Children’s Miracle Network (CMN) and other healthcare programs supported by Asante Foundation. Asante Foundation organizes community support for quality healthcare in Asante’s nine-county region serving over 600,000 people in Southern Oregon, Eastern Oregon and Northern California. As a CMN designated hospital, Asante provides the highest level of pediatric care in the region. The Oregon Wine Experience grew from World of Wine, an annual Southern Oregon Wine event started in 2002 by three local vintners, Cal Schmidt of Schmidt Family Vineyards, Lee Mankin of Carpenter Hill Vineyard, and Joe Ginet of Plaisance Ranch. In 2014, Asante joined the event. For tickets and information, visit www.theoregonwineexperience.com or call 541-789-5025. Guests will get the opportunity to taste extraordinary wines directly from the barrel and then bid on those wines’ futures. Art auction also included. Enjoy an intimate, one-of-a-kind dinner with vintners as they open their homes, wineries, vineyards, and cellars to guests. Serving the most important aspect of Pacific Northwest cuisine, fresh Pacific Salmon. Buffet includes beef and pork carving stations, an abundant selection of top-of-the season fresh produce, gourmet salads, and hand-crafted delectable desserts. Gold and Silver award-winning wines will accompany this amazing meal. Miracle Auction featuring Live, Platinum and Silent Auctions is followed by music, dancing under the stars, and the opportunity to exchange stories and share more wine around the fire embers. Winemakers and owners from 50-plus wineries will showcase more than 100 of the best wines unique to the region. This event offers the ultimate wine tasting experience accompanied by an array of tasty food samples provided by local caterers and restaurants. Various times each day at Bigham Knoll in Jacksonville and at the Southern Oregon Wine Institute in the Umpqua Valley. Shhh….we’ve been keeping a secret so hard not to tell. How our latest vintages of Sauvignon Blanc, Chenin and other wines turned out so well! We are happy to share that the Editors at the Wine Enthusiast – one of the world’s leading resources for wine news – recently reviewed and rated Ledger David wines. Before the results are announced in the publication’s August Issue, we wanted you to be the first to hear the results! With just 87 cases of the 2014 Sauvignon Blanc produced and only 182 cases of the 2013 Chenin Blanc produced, these wines are offered with limited availability while vintage lasts. Ledger David also received 89 Points for its 2012 Sangiovese and 2011 Syrah. Both wines are available on a limited basis. The results will be published in the magazine’s August Wine Buying Guide online and in print. For more info, visit http://buyingguide.winemag.com/. To purchase any of these wines, visit www.ledgerdavid.com/buy-wine/.